Has your baby started eating solids? Are you looking for different foods to add to your baby’s diet? One of the first foods we introduced to our baby was zucchini. Also known as a summer squash because of when it is harvested, these vegetables don't have the allergen content that others might have and can be used as a first food. 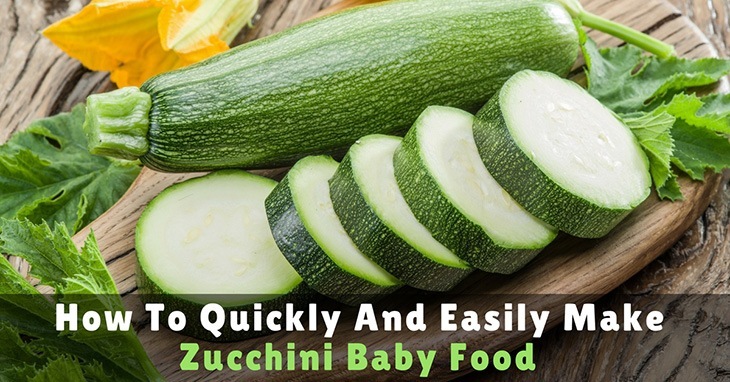 Zucchini has several vitamins and nutrients that are good for your baby. Such as calcium for growing healthy, strong bones. Magnesium that helps in digestion and creating energy. And Vitamin C which is great for your baby’s immune system. In this article I’m going to show you 3 simple ways to prepare zucchini baby food. When choosing zucchini you want to choose the ones that are smaller (around 6 inches). The smaller ones tend to have better taste and texture. 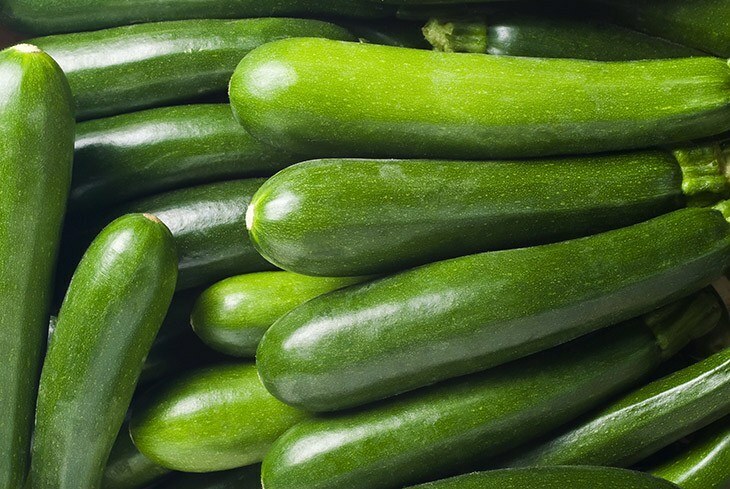 Zucchini has a softer, more delicate skin. So it’s important that you find zucchini that doesn’t have bruising or soft spots. Zucchini doesn’t fall in the list of highly contaminated vegetables for pesticides. So choosing organic is up to you. Just make sure you rinse the zucchini well before cooking and serving. When you are ready to use the zucchini rinse it under cold running water. Use your thumb or a soft kitchen rag to wipe off any dirt spots. Because of the soft skin you don’t want to use a vegetable brush. Cleaning the skin is important if you are going to leave it on while cooking, which I recommend because that is where the majority of the vitamins and nutrients are located. Has your baby just started eating solids? That means she is in stage 1 of eating (4-6 months). Since she is new to the food world you will want to puree all of her foods while in this stage.Pureeing zucchini is quick and easy (and you can store it). First you’ll want to rinse the zucchini well (rinsing instructions above). Steam the zucchini until tender. If you are going to boil the zucchini, use only a little bit of water (there is a lot of water already in zucchini so adding too much water to the boil will make them too mushy and runny). Once zucchini is tender (NOT overcooked and mushy) drain and transfer to your blender or food processor to puree. Let cool then serve or freeze. Pureed zucchini baby food is easy to store. You can keep it in the freezer for up to 6 months. However, it can be a little watery when thawing so make sure to not add water when heating up. You can also mix the puree with a thicker puree (i.e banana) to even out the thinness. Steaming is a great way to make zucchini for your baby when in stage 2 of eating solids. Meaning she is ready for soft bite sized chunks of food (8-10 months). Because zucchini already has a soft texture, steaming it won’t take long, about 10 minutes. Rinse the zucchini well (rinsing instructions above). Stage 2 of eating solids is a good time to start adding spices to her food. If you want to add more than salt and pepper to the zucchini you can add minced garlic (1 clove) and oil (½ tbsp). There are other spices you could add to zucchini give your baby more flavor. Pay attention to your baby’s cues. She may not have the same tastes as you. Just like adding new foods to her diet, I only give my baby one new spice at a time to monitor which ones she does or doesn’t like. If your baby is in stage 3 of eating solids (10-12 months), baking zucchini is a great way to add texture and taste to your baby’s genre of foods. I provided the recipe for you below (and this happens to be one of my favorite recipes). Rinse the zucchini and discard the two ends. Slice the zucchini in half longways. Place the zucchini on the foil. Drizzle the oil on the cucumber halves and sprinkle with salt and pepper. Close the foil loosely as if making a pouch. 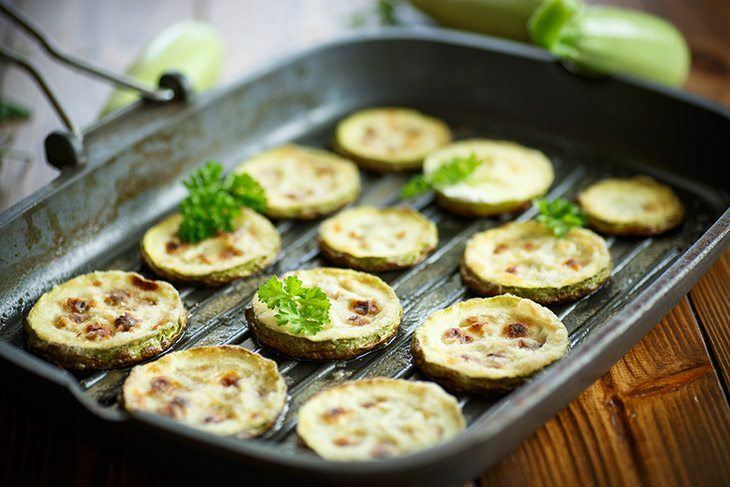 Bake in the oven at 375 degrees for 15-20 minutes or until the zucchini is tender. Put back in oven (not covered) for another 1-2 minutes or until cheese is melted. Zucchini doesn’t have a strong taste to it so it makes for a good food to add in other meals. Meals you know your baby likes. This helps to add nutrients to your baby’s diet without them fighting you on it. There are so many different things you can do with these extras. Puree them with the zucchini, use them as separate dishes (i.e. steamed zucchini with baked chicken), or make them one dish (i.e. steamed zucchini in a pasta dish). Just remember when introducing new foods to your baby it is recommended that you do one food at a time, within a week a part. This will allow any allergies to show before trying another new food. 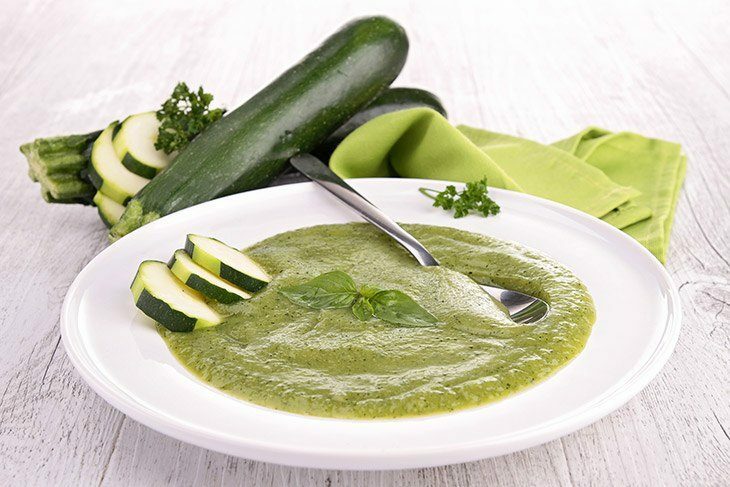 Making zucchini baby food is great for your Little One at any stage of eating. Whether you puree, steam, or bake zucchini you are providing a vitamin and nutrient rich food for your baby without spending a lot of time in the kitchen. Did you find this article helpful? Did your baby find these recipes tasty? If so let us know below, we’d love to hear from you.